An extremely robust and highly capable inkjet printer in the midrange of the market, Canon Pixma iP6600D gives good image and photo prints and is highly versatile too. The maximum print resolution of 9600 x 2400 dpi gives very good quality photo prints. The 6 Canon Pixma iP6600D ink cartridges include light cyan and light magenta, further enhancing the results, they have a life of 300-400 prints depending on the usage. The text printouts come out looking hazy and not so clear. In real world tests, the prints were at 3.2 ppm for texts and 1.5 ppm for colour. 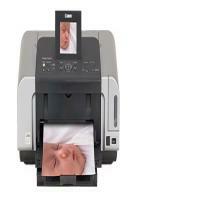 This further makes this a more specialised photo printer with light usage. There are 2 trays, one in front and one in rear, with both capable of handling 150 sheets. The printer is reasonably compact with a LCD at the top which has a more kiosk style front menu with preview option to print directly from memory cards or PictBridge. As there are individual ink tanks, replacing Canon Pixma iP6600D ink cartridges is an easy and relatively cost effective task. All the features of Canon Pixma iP6600D indicate its intent to be one of the better photo printers, with not much emphasis on document printing. Canon Pixma iP6600D can be connected to most of the available options and gives good quality photo prints too. However its average text and documents printing quality stop it from becoming a highly capable and versatile device. The printers is best used at places with extensive photo printing requirement and minor text print usage. Q.How can i get rid of print quality problem if the print results are faint and colours are not printed correctly? When the printing becomes faint or colours are incorrect, then it may be possible that you are using old Canon Pixma iP6600D Ink cartridges or the print heads are probably clogged. Follow the procedure below to resolve such issues, if print results are not satisfactory. If the ruled lines are shifted after running the print head maintenance, align the print head. Open the cover and make sure that all the ink tanks click into the place and then their lamps light red. If any one of the lamps is flashing or the associated ink tank is empty or running low. Replace the ink tank. Refer to replacing the ink tanks in the direct printing guide. Step 2: If the problem still remains after performing print head cleaning twice. Refer to the print head deep cleaning in the direct printing guide. Step 3: Perform print head deep cleaning. If print head deep cleaning does not resolve the problem, try replacing the Canon Pixma iP6600D Ink cartridges. If this also not resolve the problem contact the customer care center. Q. What are the different Canon Pixma iP6600D ink cartridges that are used for printing? What is their yield? Q. What should be done when Printing Becomes Faint or Colors are Incorrect? If missing lines or white stripes appear, perform print head cleaning. After this, print the nozzle pattern. If the problem remains after performing print head cleaning twice, perform the print head deep cleaning. If print head deep cleaning does not resolve the problem, the print head may be detective. Contact the customer care center for this. If the ruled lines are shifted, align the print head-auto head align. Q. Can I buy a pack of Canon Pixma iP6600D ink cartridges as I face a problem in buying single cartridge again and again? A. No, we do not currently stock a pack of the combination of these cartridges. You will have to buy them on an individual basis only. Q. How do we cancel printing in Macintosh? Select ‘Print’ from the file menu in your application program. The Print dialogue box appears. Select ‘Edit Printer List’ from the Printer pop-up menu. The Printer List opens. Double-click the printer name displayed in the Name list. The iP6600D dialog box opens. Select the desired document, then click Delete icon. To temporality stop a job in progress, click ‘Pause’. To cancel all the jobs in the list, click ‘Stop Printing’. Q. I changed the Canon Pixma iP6600D ink cartridges some days back. I haven’t used the printer much, but I’m already getting low ink warning. I’m very sure that I haven’t printed so much and it’s too early to get this warning. What should I do? A. Please don’t change the cartridges as yet; what you are experiencing is a common occurrence. Your Canon Pixma iP6600D ink cartridges must be having sufficient amount of ink. Since you are sure that it’s too early for you to run out of ink, you can press "Continue" to ignore the message and continue printing. If it doesn’t work, remove the new cartridge and replace it with the old one and put the old cartridge back after 10 minutes. This technique usually solves the problem. However, if it still persists, then remove the new cartridge, turn the printer off, unplug your printer at the wall and plug it back back in after 10 minutes. Insert your new cartridge and press the power button on your printer. If this also doesn’t help, then clean the metal contacts (situated at the back of the ink cartridge). If this step also doesn’t solve the problem, you ought to contact the Canon customer support. Q. I’m planning to take out the old Canon Pixma iP6600D ink cartridges from the printer (Canon Pixma iP6600D). Should I leave them in the printer and remove them only at the time of changing them or can I keep them out a bit earlier? A. Please let your old cartridges stay in the printer until you are about to replace them. Keeping them out even for a little while can result in the print head nozzles drying out. Q. Is it true that print heads become clogged if they are not used for long? Is it more convenient and cost-effective to print two pages every week or to run a printer cleaning cycle regularly? A. Yes, print heads can get clogged if the printer is not used regularly. It is advisable to print a couple of pages (or at least one colourful page every week) to keep the print heads clear. It is better than running a printer cleaning cycle, as the former uses lesser ink. At the same time, do perform printer cleaning cycle sometimes in between. Q. I’m going to install new Canon Pixma iP6600D ink cartridges (CLI 8) in my printer. How can I check whether the ink flow is proper after that? A. You need to print a few test pages to confirm proper ink flow. That’s the most common and effective way to determine the status of ink flow in your printer. Q. My Canon printer wasn’t recognising the new cartridges I tried to install (Canon Pixma iP6600D ink cartridges). What is the issue and what can I do about it? A. Please remove the cartridge and smoothly wipe the electrical contacts of the cartridge. Please do it with a clean paper towel or a lint-free cloth piece. You need to remove the dust and residue that may have been hampering the electrical contacts from the printer. If you find that the printer still isn’t recognising the cartridge, take it out and turn off the power on the printer. Unplug the printer for up to 60 seconds. Next, plug and power the printer and install the cartridge and print again. Q. Is it ok if I let my printer stand for a while with an empty ink cartridge in it? A. No, please make sure you don’t let that happen. You can insert a new ink cartridge in it or cover the print head unit in a plastic bag with some drops of water to it as a temporary measure. Q. How can I ensure that my ink cartridges give optimal performance and no problems arise while handling them? A. Firstly, make sure that you handle your ink cartridges with care; whenever you pick them or set them down, be very gentle, as they are highly sensitive. You need to store them in an airtight or zip-lock plastic bag and keep them in a cool and dry place. You should also keep the ink cartridges in in a head-down position. Further, avoid touching any electronic parts of the cartridge so they are in good condition. Q. I removed clogged ink from my Canon Pixma iP6600D ink cartridges by placing it in hot water and then drying it with a soft cloth exactly the way it is prescribed. How many times will I have to clean the print head before I start getting good quality printouts? A. You’ll have to clean the printhead three to four times after which you should start getting printouts that are up to the mark.